The main objective of the Trust is to offer a complete healthcare to the type 1 insulin dependent, underprivileged diabetics especially children and with a particular focus on female diabetics. Reducing the long term chronic complications. Rehabilitation , (Vocational training, employment, marriage). Creating better awareness & education of children and their parents (Picnics, etc). Ensuring survival of diabetic children: The Trust was formed, 5 years ago, after the shocking incidents of deaths of 2 girls for want of insulin! Hence, the first objective is of ensuring their survival. Ever since, the trust started giving regular insulin supplies to children, and there have been no deaths. Reducing morbidity: These children have problems like recurrent ketoacidosis, diabetic coma, soft tissue infections (abscess), chest tuberculosis and growth retardation. This is mainly due to intermittent stopping of insulin, "under-dosing" because of economic constraints & once a day insulin only! These problems lead to a drop in school attendance. Our experience in the last few years shows that these sponsored children have shown a significant spurt in growth velocity, a reduction in the frequency of ketoacidosis, coma and infections. Majority of them are taking 2 to 3 insulin injections every day, with an optimum dose for their body weight. A definite improvement in their school attendance and self esteem has been noted. Even the approach of their parents towards them, has improved! Over the years, type 1 diabetics develop microangiopathic complications like retinopathy (eyes), nephropathy (kidneys) and neuropathy (nerves).These complications occur prematurely and more frequently in type 1 diabetics who have uncontrolled diabetes. Scientific research , e.g. DCCT (Diabetes Case Control Trial) has clearly shown that these complications can be prevented and if already existing, their deterioration can be slowed by strict control of diabetes with intensified insulin therapy using 4 - 6 injections a day,frequent home blood glucose monitoring, with the objective of achieving blood glucose values as near as possible ( with glycosylated haemoglobin-GHbA1C-well below 7 %). At present the Trust is providing insulin alone and the control of diabetes in these sponsored children is far from ideal . With the availability of more funds, we plan to provide blood glucose measuring meters & strips and do regular estimations of GHbA1C. Rehabilitation: These Type 1 diabetic children from low socioeconomic strata are less educated and therefore cannot compete for better employment opportunities. 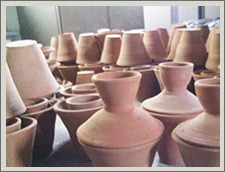 The Trust has plans to organize vocational training for the children so as to make them self reliant. Another problem among the girls due to the prevailing socioeconomic problems, the parents find it difficult to arrange their marriages and being a diabetic, are a stigma for them. The Trust has so far been able to help 13 girls who are successfully married. Creating better awareness& education of children and their parents: There is an urgent need to educate parents and their children regarding their diabetes, possible complications and their remedies. There is still a tendency to switch over to alternative medicine and stop insulin. 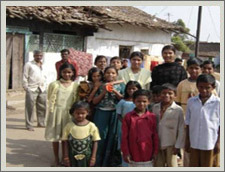 The Trust regularly organizes meetings of these children and their parents. Every year picnics are organized where parents and children are invited to participate without any financial contribution, where recreational and educational activities are organized. They are provided free transport and meals. 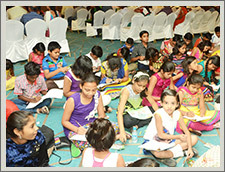 We here at DREAM Trust, which is a charitable institution, work in a small way, towards making the life of diabetic children especially female diabetics, more bearable and more meaningful. The main object of the Trust is to help poor children with diabetes. People at large, in India, are not medically insured and have to buy insulin injections, syringes and other accessories required for treatment. Dream Trust is for diabetic children whose life is dependent on insulin injections. Even stopping insulin for one day leads to diabetic coma and death. The Trust provides free insulin, syringes, blood glucose meters, strips, insulin pens to these diabetic children. During this year 2014-2015, The Trust provided free insulin, syringes, blood glucose meters, strips, insulin pens to these diabetic children. 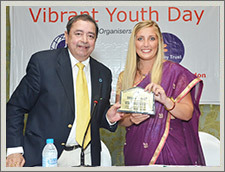 The number of sponsored children by Dream Trust had risen to 1200 this year. We have provided 70000 vials of insulin , 56000 insulin syringes, 120 glucose meters, 4500 blood glucose strips, 100 insulin pens this year. 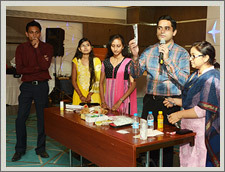 Our educators are educating the type 1 Dm patients who were assembled during our weekly camp. 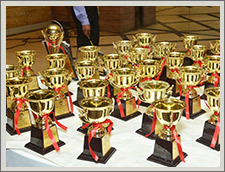 Rehab program was launched in the year 2012. Under this program we have the following activities and the total amount spent under each head are given below during this financial year 2014-2015. Dream Trust has so far donated more than 270 bicycles . Bicycles are provided mainly to prevent school drop outs of girls . These girls after their primary schooling have to travel a long distance to continue with their high schooling. Bicyles are provided to needy boys with Type 1 diabetes. Dream Trust provides travel Grant to the serving type 1 DM enabling them to visit Dream Trust every 3 months to collect their insulin. In this financial year 2014-2015,until now we have provided INR 1,44,872 travel grant to the deserving poor type 1 children of Dream Trust . The number of beneficiaries are more than 600 children. 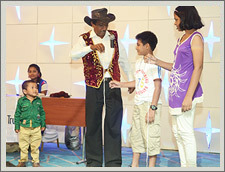 Two magicians entertained the children with different magics and showed them some interesting tricks. 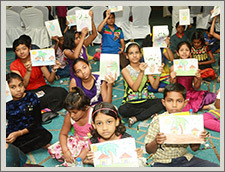 Parents of these children participated in interactive educational session. 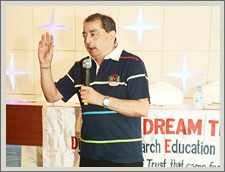 Dream Trust organized interactive educational session for parents of diabetic children and gave guidelines for management, coping with chronic illness and avoiding emergencies. Balanced and healthy nutrition guidelines discussed. Mrs. Seema Chalkhore, Senior Nutritionist , Ms. Harshada , Ms. Prajakta discussed various aspects of giving balanced and healthy nutrition, with parents of diabetic children. Emphasis was on altering dietary habits keeping in mind economic conditions and affordability of rural patients. They also discussed insulin injection techniques, sick day rules, Hypoglycemia and its treatment and gave practical demonstration Dr. Sharad Pendsey, Dr. Sanket Pendsey & Dr. Kotwal participated and answered queries. 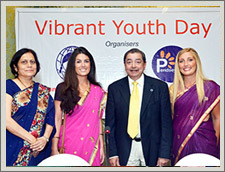 Dream Trust celebrated “ Vibrant Youth Day ” on 26th August 2014 at Hotel Centre Point, Nagpur. 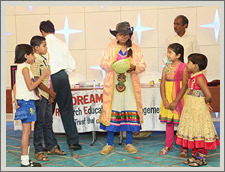 Meritorious students of Dream trust ( juvenile diabetics ) were felicitated. 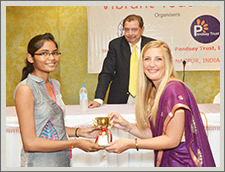 Ms. Lucy Laycock, President , Pendsey Trust, London was the Chief Guest.